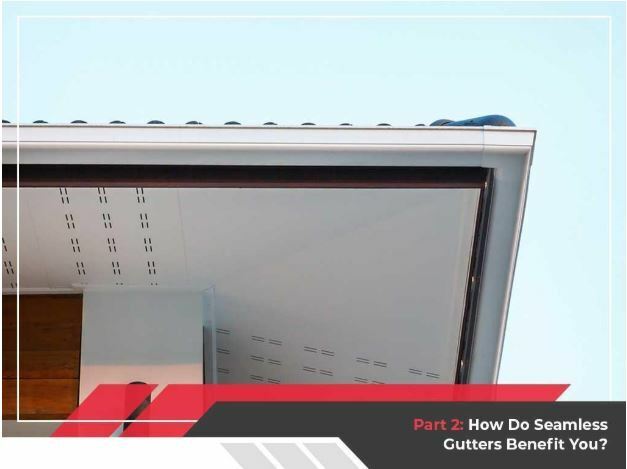 Seamless Gutters: What Every Homeowner Should Know - Part 2: How Do Seamless Gutters Benefit You? Seamless Gutters: What Every Homeowner Should Know – Part 2: How Do Seamless Gutters Benefit You? > Blog > 3-Part Blog > Seamless Gutters: What Every Homeowner Should Know – Part 2: How Do Seamless Gutters Benefit You? Reduced potential for leaks. The problem with sectional gutters is that they have too many seams. Even well-constructed seams with the strongest sealants will wear down over time, making it easy for water to escape from the inside of your gutters. You no longer have to worry about this when you choose a seamless system. This is because the only seams they have are around corners, leading to fewer chances of leaks forming in the system. This ensures water runs continuously inside the system and out the downspout, instead of dripping from holes or gaps in the seams. Smoother performance. Leaves and other loose debris may settle inside your gutter system, leading to congestion and causing water to back up. This is even worse in sectional gutters. Their seams form ridges along the gutters’ bottom, allowing small amounts of water to build up. This ultimately results in debris forming a blockage. This is never the case with a seamless gutter system installed by a premier contractor, however.. As they’re formed from a single piece of material, they don’t have creases where water can back up, giving you a smoother, clog-free performance, plus an easier time cleaning. Healthier and sturdier home. Sectional gutters are prone to clogs, causing water to build up inside the system until it overflows. As water runs down your walls and seeps inside, it promotes mold growth. Go seamless, however, and you can prevent this issue. Seamless gutters ensure leaves, debris and water don’t build up inside the system, doing away with moisture-related issues that can affect your family’s health and the structural integrity of your home. Sleek, good looks. Seamless gutters have a neater, more uniform appearance than sectional gutters. They are custom designed for your home, so you’re sure they fit perfectly with its needs and exterior style. You also won’t lack for customization–seamless gutters are available in different color choices, materials and styles to add an instant visual impact to your home’s curb appeal. Investing in seamless gutters lets you keep your home healthy, sturdy and beautiful. With their many benefits, seamless gutter systems are truly well worth your investment. In the third and final installment of this three-part blog series, we’ll go into detail on how to care and maintain your seamless gutters properly.